9.25 "x 7.75" size. 1/4" thickness. Made of durable neoprene. Pad consists of a soft rubber backing with a polyester top. In a World Full of Tens Mousepads. 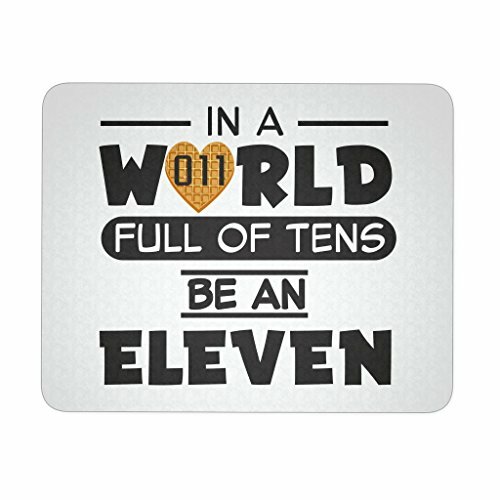 In a World Full of Tens Be an Eleven Mousepads for Women Men Kids Gamers Waffle Mousepad. In A World Full of Tens Be An Eleven Desktop Mousepad Waffle. Have a great breakfast with coffee and waffles and use this awesome large mousepad. Give this computer gaming mousepad to family and friends who like eating waffles. Vintage Style 80s Costume In A World Full of Tens Be An Eleven Rug Mousepad. Funny waffle breakfast heavy mousepad. Awesome funny mouse pad. Awesome Novelty Birthday Gift Printed Mousepads for Men Women Boys Girls Kids Dad Mom Grandma Grandpa Uncle Aunt. Printed in USA. 9.25 "x 7.75" size. 1/4" thickness. These awesome custom made one of a kind adult and kids mouse pads are not mass produced. These birthday gift or Christmas gift mousepads are made to order.